In about 6 weeks I’ll be leaving on a jet plane for Battle of the Paddle. I missed it last year and cannot wait to be part of the biggest SUP celebration around. Nearly six MONTHS ago I started looking for a 12’6″ race board to rent. The initial quest was quite specific – and within a few months I was regretting the purchase of a plane ticket and the long long drive was starting to seem like the best bet. There were no boards of any kind, any size to rent (beg or borrow) for the event. I was thinking of dumping the plane ticket and strapping my surfboard to the car and heading south to be a part of the OPEN Surfboard class. Then I had the chance to talk with Steve Gates at Big Winds in Hood River, Oregon. He had the answer for me – and for many others, most likely. He invited me to come on up to take the Big Winds shuttle and give his demo/rental Naish ONE a try on my favorite down wind run from Viento to the Hood River event site. Better yet, I thought I’d buy one – but these inflatable one-design standup 12’6″ boards are so popular that they’ll be sold out for another week or so. I will have to wait until I arrive in Hood River for the Naish Columbia Gorge Paddle Challenge to get two Naish ONEs – one for me and one for hubby, Ed. We travel a lot by air – I think these Naish ONES will get more air miles than even water miles! I carry way more baggage than what’s in the cool carry case for the Naish ONE. Rather than fill in the back story of the board specifications here, you can find out everything on the website. I grew up sailing and surfing, doing the juniors one-design sailing back in the 50’s. Then as our family grew up enjoying swimming and one-design sailing in a yacht club setting, the extensive value, family connection, sportsmanship and camaraderie around wind and water sports was priceless. 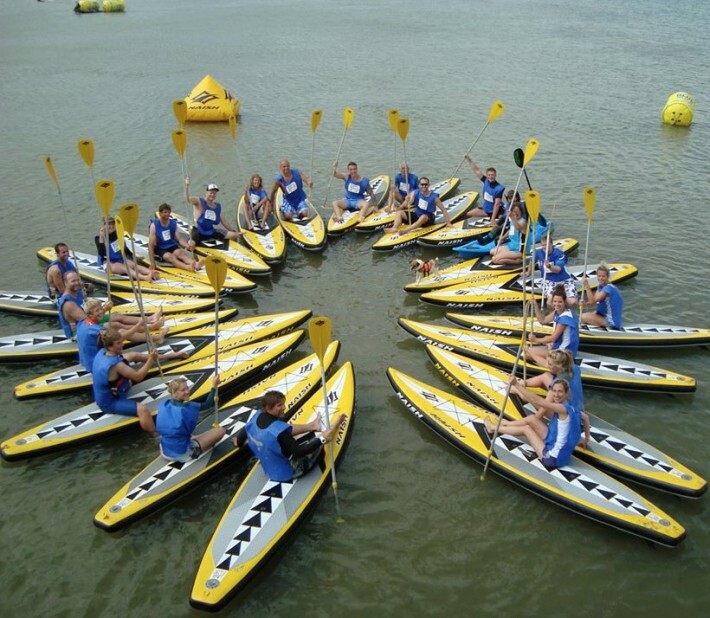 As yacht and sailing clubs begin to adopt standup paddling as a youth and family program option for sport and fitness, it’s important that the same careful consideration put into selecting one-design sailing craft is invested into the SUP purchase. I have talked with a good number of sailing coaches and program managers who have bought a small fleet of standup boards based on the “flavor of the month” suggested by an eager retailer. It’s a real shame to miss the “boat,” so to speak on the powerful trend and historical value of the one-design class. If you have influence on a decision of this type, share this information and support a wise, long term investment. It’s easy enough to locate a Naish dealer in your geographic area and get some solid information about the future of one-design and the versatility and performance of the Naish ONE.